Children's Picture Book Database at Miami University | Too big! When Charlie and his dad are at the carnival, he wins the biggest prize of all, a dinosaur. His new toy is so big, he can't take it anywhere!Charlie's dinosaur must stay at home while he takes his other toys on outings, until he has to go to the doctor. All of the other toys hide so they don't have to go to the doctor's, but the dinosaur is too big- he can't!After their trip to the doctor, Charlie and his dinosaur are inseperable. 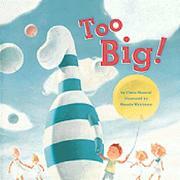 Masurel, Claire, “Too big!,” Children's Picture Book Database at Miami University, accessed April 18, 2019, https://dlp.lib.miamioh.edu/picturebook/items/show/10423.